What’s it all about, Bergland? The wine regions of Austria have always seemed a bit confusing to me. Actually, that’s an understatement—but the issue is with me, not with Austria. I just need to focus. So here goes—I’m diving straight into the area that has (in the past) confused me the most, and am determined to develop a crystal-clear understanding of Bergland. For starters: Austria has four main Weinbaugebiete (we’d call them “quality wine regions”). They are: Burgenland, Niederösterreich (Lower Austria, referring to being down-river on the Danube from the region they call “Upper Austria), Wien (Vienna), and Steiermark (Styria). These four regions are also states (or, in the case of Vienna, a capital city that serves as its own state, much like Washington DC here in the US) and can therefore serve as a PDO designation of origin—and—these regions may also contain more specific subregions (which may or may not be a Districtus Austriae Controllatus [DAC]). Did someone say confusing??? 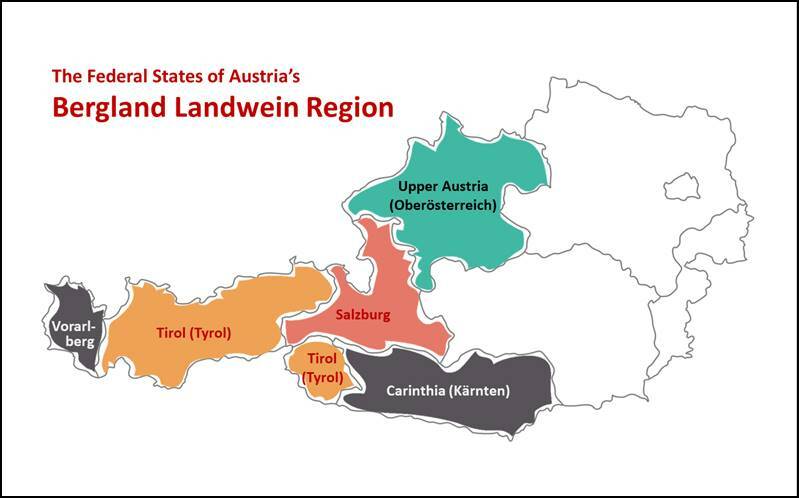 What’s Bergland got to do with it: Austria also has three large Weinbaugregionen (Landwein regions), or regions that are approved for PGI (protected geographical indication) wine. Two of these—Weinland Österreich and Steierland—neatly overlap with the PDO regions and are simple enough. However…there’s Bergland (not to be confused with Burgenland)…with no subregions and no overlap with the Quality Wine Regions of Austria. If you check out my handy-dandy map, you’ll see that all of Bergland lies in the western section of the country which has typically been thought of as too cold, too mountainous, and too alpine for high-quality wine production (but a fantastic place for schnapps and beer—keep in mind that a good portion of the area is just south of Germany’s Bavaria). However, as we’ll see, there are some nooks and crannies of this rugged area that make for decent vineyard land, and wine is produced here. Oberösterreich (Upper Austria): It makes sense that the region upriver on the Danube would be a fine region for viticulture; after all, after the Danube crosses the political boundary separating “Upper” from “Lower” Austria, it flows through the famous wine regions of Wachau, Kremstal, Traisental, and Vienna. The area of Upper Austria did (historically) have quite a dynamic wine industry, and after several decades of decline, is back in business. 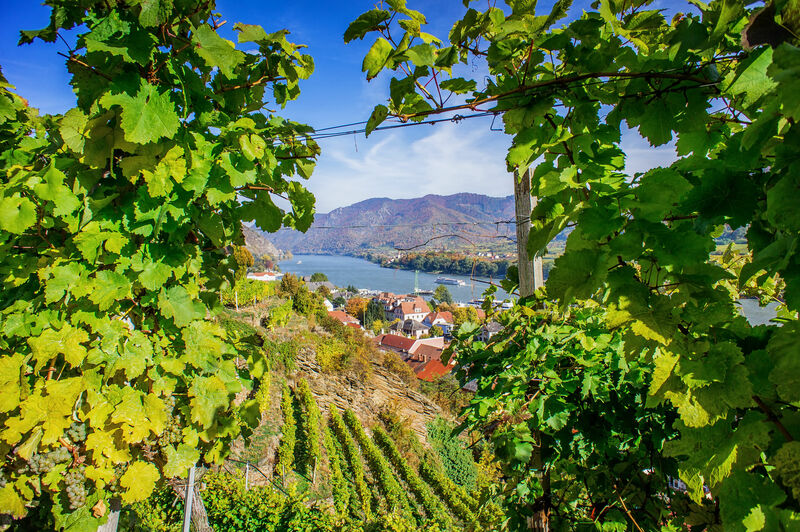 Upper Austria currently has about 112 acres (45 ha) of vines, both in the Danube River Valley and the hilly regions closer to the center of the state. Salzburg: Apparently there is more to Salzburg than the Sound of Music. 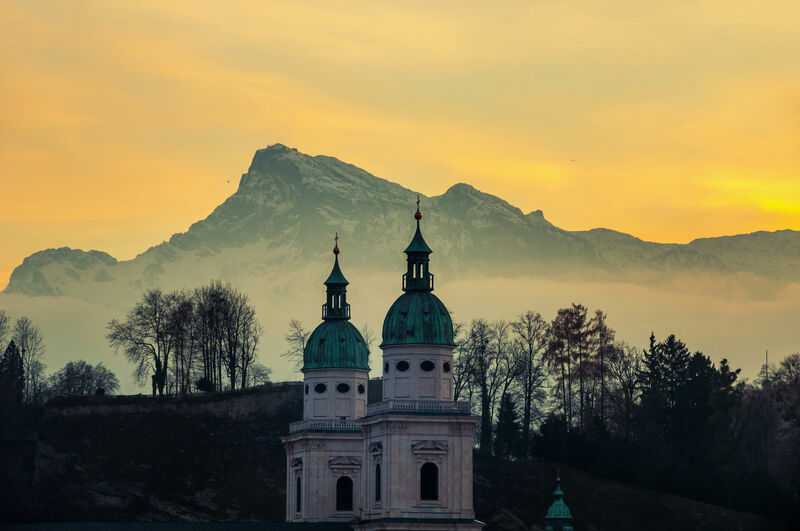 However, if you are familiar with the classic musical (movie version), you no doubt noticed the soaring Alps surrounding the city, and indeed, the city of Salzburg is known for its five mountains, one of which—Mönchsberg—is home to vineyard overlooking the city. While apparently a new phenomenon, it seems there are now several vineyards in the state of Salzburg (totaling about 18 acres [7 ha]), and even a few within the city limits. This version of what they call “Mönchsberg Sparkling Wine” looks fascinating! 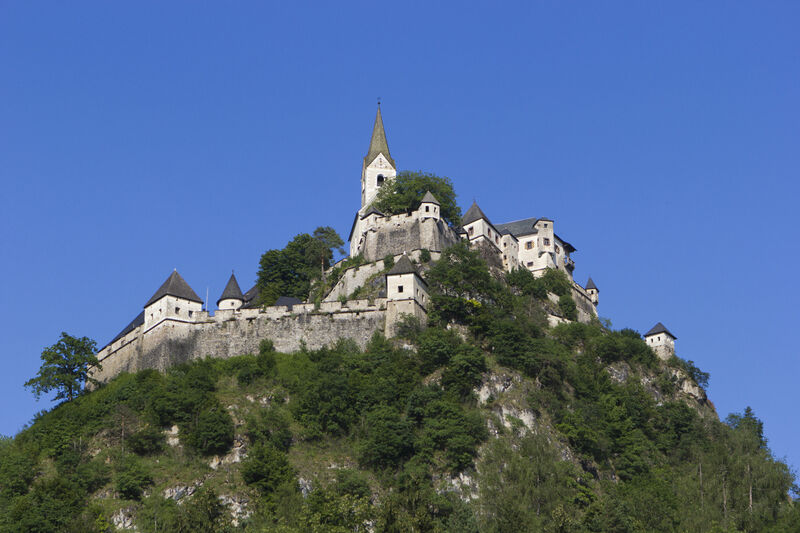 Voralberg: Voralberg is the westernmost state of Austria, bordering Switzerland, Germany, and the tiny country of Lichtenstein. Voralberg touches on Lake Bodensee and the Rhine River, and is close to a few outlying portions of the Württemberg and Baden wine regions of Germany. As such, it makes sense that there was once a thriving wine industry here; by some accounts the area had over 500 hectares planted to vines once upon a time. However, phylloxera reared its ugly head, and the industry has been slow to bounce back. Currently, Voralberg has 25 acres (10 ha) of vines, including one located in the town of Röthis, just a few miles east of where the Rhine River forms the border between Austria and Switzerland. 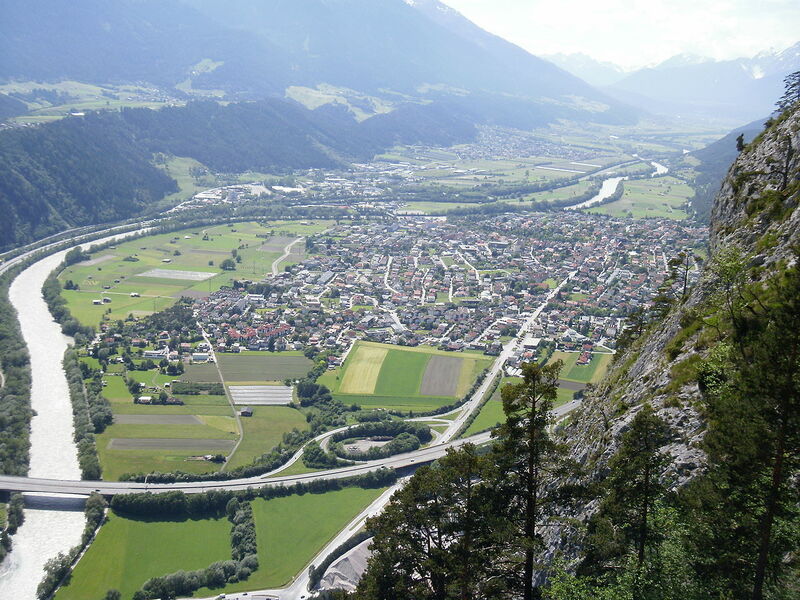 Tirol (Tyrol): If you are familiar with Italy’s South Tyrol (Südtirol, aka Alto Adige) wine region, you may have wondered if there is a “North Tyrol.” Well, there is—and it is just north of Italy, in Austria. The state of Tyrol is discontinuous, divided by a 4.3-mile- (7 km-) wide strip; the larger area, straddling the area between Italy’s South Tyrol and Germany’s Bavaria, is known as North Tyrol; the smaller portion is East Tyrol. There is some historic connection to wine production here, including a (no longer cultivated) 14th-century vineyard located in Zirl—the products of which were greatly appreciated by Emperor Maximilian I (1459-1519). Modern winemaking is springing to life as well, and Tyrol currently has 12 acres (5 ha) of vines and over two dozen wineries; check out the website of the Weinbau Verband Tiroler here. Grapes and wines produced in Bergland are similar in variety and style to the overarching wines of Austria. White grapes prevail—particularly Grüner Veltliner, Riesling, Pinot Gris, Pinot Blanc, Chardonnay, Sauvignon Blanc, and Müeller-Thurgau. The main red grapes are Zweigelt and Blauer Burgunder (Pinot Noir).